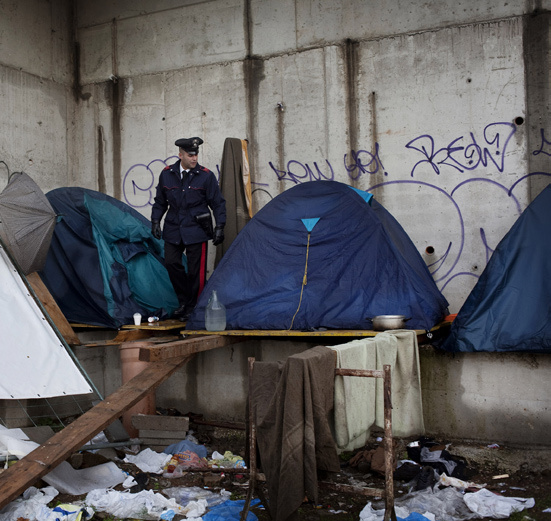 Refugees in Italy – both asylum seekers, as well as those who already have obtained a protection status – live largely in absolute misery and homelessness. Most of them are ejec­ted from the Ita­li­an basic accom­mo­da­ti­on sys­tem for asyl­um see­kers after a maxi­mum of six mon­ths and end up wit­hout any assi­s­tan­ce to speak of. The sta­te of affairs is docu­men­ted in Pro Asyl’s Febru­a­ry 2011 report “Zur Situa­ti­on von Flücht­lin­gen in Ita­li­en” of which an Eng­lish trans­la­ti­on is now avail­ab­le. The aut­hors, Maria Beth­ke and Domi­nik Ben­der, inves­ti­ga­ted the con­di­ti­ons in the fall of last year, in par­ti­cu­lar tho­se in Rome. They spo­ke with refu­gees living in aban­do­ned buil­dings and in vacant lots on the out­s­kirts of the city, as well as with rep­re­sen­ta­ti­ves of UNHCR, church­es, and NGOs. Their con­clu­si­on: the con­di­ti­ons are for the most part unfit for human beings. This is also true for many peop­le who were gran­ted some form of pro­tec­tion sta­tus and right of resi­dence by the Ita­li­an aut­ho­ri­ties. The pla­ces avail­ab­le in the recep­ti­on sys­tem for such peop­le are so scar­ce that they are gene­ral­ly left to fend for them­sel­ves. Wit­hout a claim to housing or the secu­ri­ty of a mini­mum sub­sis­tence level, they find them­sel­ves back in a strugg­le for sur­vi­val over many years.